They say all good things must come to an end. (We don't really believe that, but for the sake of putting a metaphysical slant to a post, we'll claim allegiance.) 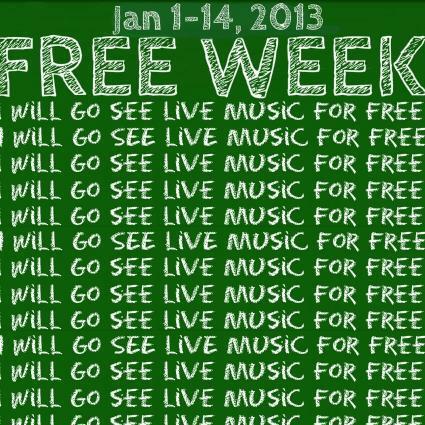 And, sorry to say, Free Week is no exception. Waah. Zorch, The Boxing Lesson, Boyfrndz, Tiger Waves, and Residual Kid will be doing the free thing at Holy Mountain tonight. And right next door at Red 7, on the inside you can find Troller, Marriage, The Sour Notes, Wet Lungs, and Spray Paint; whilest the outside stage will be taken over by White Walls, Cheap Curls, The Well, and Holy Wave. The Mohawk has a huge going-out-of-Free-Week show with the outside stage hosting Silent Diane, FEATHERS, BOAN, and Rare Species. Inside, we'll have The Sour Notes, The Couch, Shivery Shakes, Letting Up Despite Great Faults, and The Plastic Habit. And Red 7 will host TV Torso, Oh No Oh My, Hundred Visions, and Tiger Waves. Last and definitely not least, you could scoot over to Club DeVille and catch Oh Look Out, Friday Avenue, (one of our best of 2012) Borrisokane, Knifight, and Hydra Melody on the outside stage, whilest inside you can see Pop Pistol and Migrant Kids. 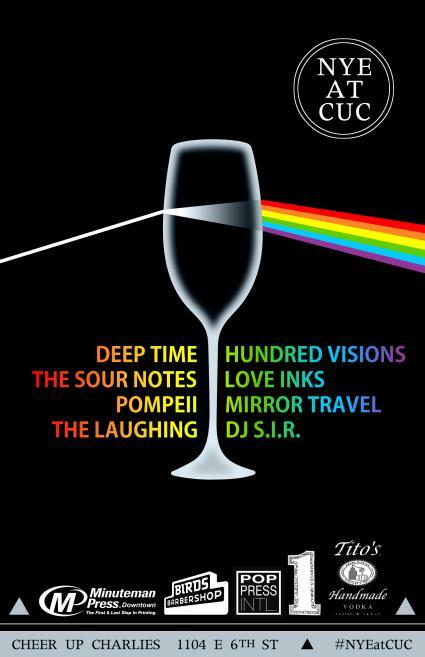 Perennial local favorites The Sour Notes are throwing another one of their epic New Years Eve parties. And Yeah, you're invited to hang out with them, Deep Time, Hundred Visions, Pompeii, Love Inks, The Laughing, and Mirror Travel for a night of fun and frolic at Cheer Up Charlie's. Cool. Meanwhile, over at Frontier Bar, Slacker Magazine is throwing a Blacklight Party with Ringo Deathstarr, JAPANTHER, The Boxing Lesson, Megafauna, Residual Kid, Mighty Mountain (Formerly PYRAMID), and The Sun Machine (Formerly THE SOUL PILOTS). Stubb's is bringing in the New Year with T-Bird and the Breaks + Henry + The Invisibles. The Beauty Ballroom is hosting Grupo Fantasma and Foot Patrol. Neon Indian is headlining at The Mohawk, warmed up by Silent Diane and S U R V I V E.
And ND's NYE event includes Not In The Face, The Couch, The Sideshow Tragedy, and AC / ND. Well, you have all day to decide. And to get you prepped, mentally and emotionally, for that decision, Zooey and Joey are here for you. EP Review- Residual Kid- "Faces"
Perhaps you're familiar with the schmaltzy School of Rock thing (thank you Jack Black). But you know, in the "life is stranger than fiction" vein, a real honest-to-goodness School of Rock does exist, and it... (wait for it) ROCKS. 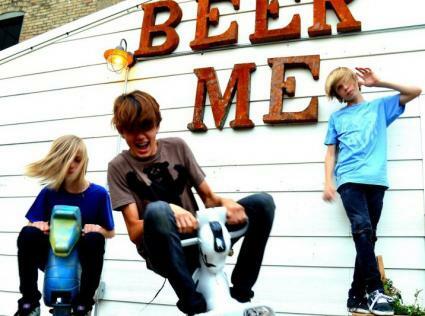 And guess what else - there's a real honest-to-goodness band comprised of adolescent boys called Residual Kid and they... (wait for it) ROCK. 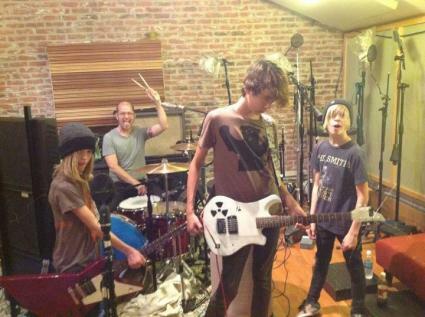 Yep - The drummer is 14, the guitarist is 14, and the bassist is 12. You can't make this stuff up. Well, you can, but it's not as good as the Real Deal. Because if you or I concocted this story, the kids would be heartthrobs and play a radio-friendly brand of pop. You know, like the Bay City Rollers (or, if that's too old school for you, the Backstreet Boys (Editor's Note: Scott, I am not going to link the Backstreet Boys)). But the juicier truth is that these yard apes, these Residual Kid guys, will melt your face clean off. You've been warned. Don't believe it, do ya? Check out their brand new EP, "Faces" - Recorded and produced by Grammy-nominated producer Chris "Frenchie" Smith, it's 6 tracks accost with crystal-clear crunch, perfectly-polished punch, alt-rock vox, and the panache of a more experienced mien. Go ahead, jump right in and give the first (title) track, "Faces", a minute, see what we're seeing. A mean guitar thrash launches a grungy bass/drum groove, bookended with solid guitar work and easy-to-sing-along lyrics. Follow that up with "Friend", a nastily-rumbling bass-ish tune, and you'll have to admit that No, this doesn't sound like a bunch of kids. The next track will, however, after the vocals kick in - at that point, after some excellent head-bobbing crunch, you're expecting something a bit more burly. The remaining tracks do nothing but seal the deal - "Pulling Through" with it's relentless lead, "Lab Rat" with it's dirtied vox over confident melodic pauses, and "Lost Cause" with it's stabbing guitar/bass pairings and everyman chorus - "I've been fighting for a lost cause". Me too - Welcome to the real world, kid. OK, so seeing is believing? Check it, you can catch them live - They're playing Fun Fun Fun Fest this weekend. Come back and tell us if that face-melting comment is for real (Editor's Note: Or not, seeing as your face will be gone). Until then, or maybe afterwards, you can keep tabs on these fine young men at www.residualkid.com and on Facebook. 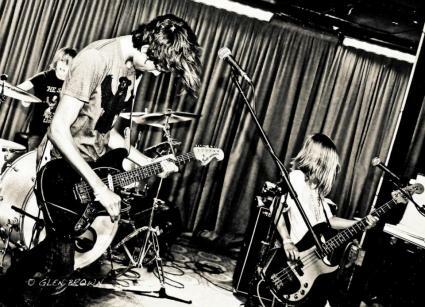 New Video- Residual Kid- "EP Release Party (Full)"
New video of Residual Kid's EP Release Party. Such beautiful noise. We're so proud of our very own Austin boys. Do not, we repeat, do NOT miss them at Fun Fun Fun this weekend. Smash your guitar Pete! Residual Kid has released a video along with their fantasticly sludgy new single "Friend". While I'm always a bit skeptical of the actual punkness of skateboarding, the video is an absolute treat to watch; especially near the end when the kids pull a Pete Townsend on their instruments. "Friend" itself is somewhat tongue in cheek, with lyrics like "If they open their chests, and let out the flies, they wouldn't be so quick to judge". Coupled with a la di da chorus and poppy but clever chords, "Friend" is not a song to pass up. The trio has a show next week on the 18th at Stubb's and they'll also be at Fun Fun Fun fest this November.